In late July I returned from West Africa to Chicago, which to my surprise was hotter and dryer than Sierra Leone. I heard no news of the Midwest. drought until I was back in the States, and at first I didn’t realize the gravity of the situation, not just for the U.S., but for the entire world. Current estimates say that at least 60% of the U.S. has a drought, which is in fact the worst drought in America since 1956, and has caused the cost of corn to rise 50%. Unfortunately, corn is a very large U.S. export and it is used in other products such as animal feed and many processed foods, which might well result in prices of other food products rising as well. Furthermore, about 40% of America’s corn is used in ethanol, whose production has since been slowed since it is not economical at this time. 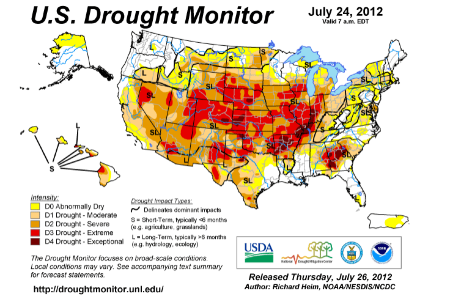 The drought is not limited to the U.S. Similar droughts are occurring in other large crop-exporting countries, such as Ukraine, Russia, and Australia, which has caused international crop stockpiles to fall – causing some to panic. With the falling stock piles and limited crop production in these countries, prices for corn, other food products, and oil/ethanol have risen, which has allowed the monopolies that control those sectors to benefit greatly. This drought not only exposes the problems within America’s farming industry, but on a larger scale it exposes the faults in the global food system of dependency. Out of the 7 billion people of Earth, 1 billion are malnourished – and that is not because there is a shortage of food in the world, if fact there is enough food to feed the entire world population. However, much of the global food system is monopolized by the U.S. and the global North, which means that many developing nations are required to import much of their food, even if they are located on fertile lands. With American farmers subsidized, many farmers in developing nations are unable to compete with the U.S.’s prices, so they instead choose to grow things such as cotton which are more profitable. Any changes in the global food market are especially volatile and dangerous in the developing world since they mostly depend on industrialized nations for their crop imports. That is why, in times like this when there is drought, or a rise in fuel prices, or futures sell at a higher value – then it often leads to food insecurity and famine in the global South because they are unable to afford the higher cost of food. Furthermore, as Eric Holt-Giménez, Executive Director of Food First, notes in an interview – free trade agreements have further exacerbated the already existing problems by making developing nations even more dependent on U.S. exports. The perceived “scarcity” of food then results in land grabs, which I will discuss in more detail later. The Drought on a Global Scale: What is being Effected? The crop yield in the Midwest is down drastically from previous years, and although we are seeing some of the effects of this drought now, the real effects might not be seen for another 6 months down the line. The UN Food and Agriculture Organization (FAO) releases a monthly Food Price Index, which measures the change in international prices of five food commodity groups: oils/fats, cereals, dairy, meat, and sugar. 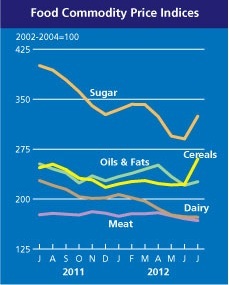 Since July 2011, the five measured food commodity groups have had their prices either steady or decrease over the year (with the exception of a short spike in oils/fats in April). However, the most recent FAO report shows a drastic increase in both sugar and cereals, which is a result of the droughts in the U.S., Australia, and Russia. The most recent report stated that the Cereal Price Index increase 38 points (17%) from June, and is now only 14 points below the all-time high, which was set in April 2008 during the last food scarcity problem. The report blamed the U.S. drought for the spike in prices and stated that the price of maize had risen 23% in the month of July, and wheat prices rose 19% with anticipation that the demand for wheat by the agricultural sector will only continue to increase in order to augment the maize shortage. The Drought on a Global Scale: Where is it Effecting? I think it is safe to say that nowhere will be exempt from seeing the effects of this pending food crisis. 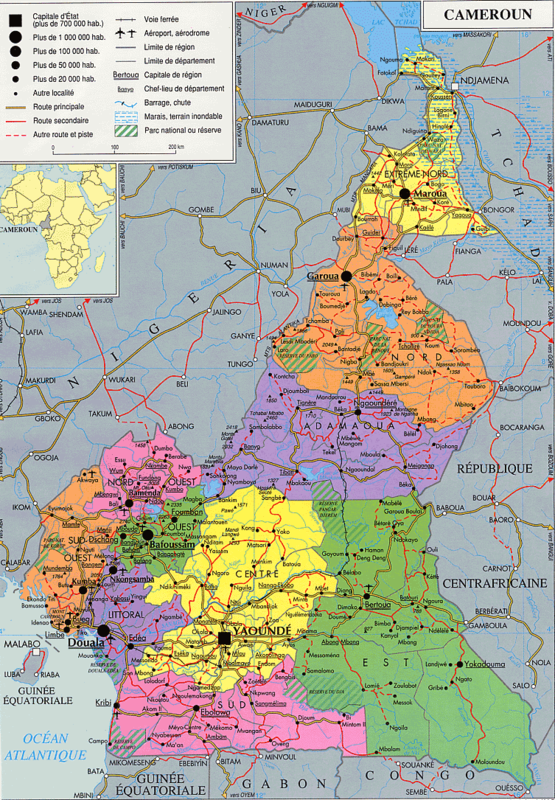 However, particular areas will be especially effected, such as South-East Asia and Africa. For example, the Sahel is already experiencing a food crisis, so the increased price of cereals and sugars might well only worsen the problems they are facing. The humanitarian news and analysis agency, IRIN, notes that prices of locally produced grains in the Sahel countries are now 50% higher than last year. Several South-East Asian countries such as the Philippines, Bangladesh, and Indonesia would be victims of a global price hike since they are large importers of wheat. Furthermore, India had minimal rains during its monsoon season and is also experiencinga drought according to IRIN. Any tightness in the supply of maize and soybeans, used mainly as livestock feed, could impact on wheat, the world's most widely consumed staple grain. A similar food “scarcity” crisis occurred in 2008 – the only difference being that instead of higher cereal prices it was higher wheat and grain prices, which significantly impacted major wheat consumers like Africa and Asia. Some argue that the rise in corn and soybean prices this year could ignite food protests much like those witnessed in 2008 that took place in Italy, Morocco, Egypt, Senegal, Mozambique, and in Haiti were 4 died and in Cameroon where 40 were killed. I have created the map below which illustrates the crop-exporting countries currently experiencing a drought, the countries that saw food riots in 2008, and the countries most at risk for food insecurity this year if cereal and maize prices continue to rise. From this map, the North/South divide of the global food system is evident. The North controls the production, where as the South relies on imports and therefore is most vulnerable to insecurity and riots – but I will delve further into detail on that topic next week. The current drought is not isolated to the regions experiencing them. The real effects of this poor crop season will not be realized for several more months, but it is safe to assume that many countries might become ‘food insecure’, especially in areas such as the Sahel which are already experiencing famine and the added complication of wars. Perhaps this drought will shine more light on an unintended consequence of food “scarcity” and problems in the global food market, such as land grabbing, which I will also discuss more next week. It makes me wonder that if there are so many problems with the global food market, why don’t things change? What options do those in both the crop-exporting and crop-importing countries have to make the global food system more just and sustainable? Check back for part 2 of this post next week. In the meantime, I would love to hear your thoughts on this crisis. Do you think it will lead to more food riots like in 2008? What are your ideas on how we can change the global food system? What can those who are in developing countries who are dependent on importing crops do to become more self-sufficient? I'd love to read your ideas in the comments section below.